I have had a collection of Vinyl that I had for years, but have not had a functional turntable for at least a decade. I decided it was time to put the vinyl to use and picked up a Pro-ject elemental turntable. It gets good reviews and I got a good deal on it new from partsconnexion. Well that was several months ago and it had sat ever since. Over the holidays I finally ordered a pro-ject phono box preamp so could actually get this setup spinning (sorry). The first vinyl I listened to was Miles Davis live evil, it sounded pretty good. I have been exclusively cd for ever because I could not stand the added noise of vinyl, but this sounded really good. There is really something to the sound. I threw on Traffic and it sounded good, but not like the CD. There is some detail there, but there is a little distortion. I attributed this to the record being as old as I am. I ordered a couple of brand new records to really check this setup out. I ordered two records who’s cd sibling are in the player often so I am familiar. The first is a single that has four songs. It contains a track with a guitar section that I really enjoy. It was unlistenable on the vinyl. It was as if I had kicked on a distortion pedal. It was that bad. The next night I played the other new record. It is a 180 gram pressing, which I did not know when I ordered it, but it makes sense because the cd version is hd. This sounded ok, but again there is just too much distortion. Some elements of the songs sound great, while others sound terrible. I know this is a “budget” deck, but I did not expect distorted sound. I have thought about upgrading the cart, but I’m not sure how far I want to go upgrading this one before I should have just upgraded the whole deck. I’m a little torn because I hear the potential that is there. Am I expecting too much out of this setup? I know there are at least a few vinyl gurus here that might have some thoughts. A couple of things... get record weight equaling better quality out of your mind. The thickness of the L.P. has nothing to do with it's dynamic range or pressing reproduction. The only thing it can possibly add is physical stability to the disc... less warp. As a matter of fact more vinyl can actually equal more static build up. I find that a lot (and I mean a substantial number) of modern pressings are horrific. You can have many issues... poor VTA, incorrect VTF for your cart, overly aggressive or not enough anti-skate, to much gain or to little RIAA, and more things. What cartridge are you using and have you messured your head shell weight? It could be something as simple as not enough weight and the tracking of the needle is vibrating inside the channel. Also, are you getting equal output, good or bad, from both channels? Schu is right. There are a lot of things that could cause this. If you have a way to check your tracking force you should see where your weight is compared to the recommended range for your cartridge. If you are tracking this too light then the cartridge may be mistracking. Higher frequencies will be more noticeable during the mistracking causing them to sound sibilant and distorted. Best to find part of the record that you notice the distortion and then adjust force and relisten to that same passage. If that doesn’t address this then will need to evaluate antiskate, azimuth, tracking force, alignment etc. Are you running a moving coil cartridge through a moving magnet phono preamp? Or moving magnet through a moving coil preamp? Some receivers/amps have a selector switch. A couple of things... get record weight equaling better quality out of your mind. The cartridge is a Ortofon om5e. It was installed at the factory and is supposed to be adjusted (allegedly). I may try to adjust by ear but I need to familiarize myself with the potential adjustments and methods of gauging. It is a stand alone preamp that can be set for either MM or MC. The om5e is a MM cartridge, the pre is set for MM. it is never that easy for me. Thanks for the replies. I will do some searching. Since the four records you described seemed to sound progressively worse as you played through them, I'm gonna vote for "dirty stylus" (aka "dirty needle"). Grab a flashlight and maybe a magnifying glass and take a look - any little fuzzball you see on that tiny thing that touches the record MUST be cleaned off...carefully, and often (once every side isn't too often in filthy environments). Setting up a vinyl playback rig is certainly a challenge but keeping everything - including your vinyl AND your stylus - sparkly clean is a full-time job. You're gonna get a thousand tips on how to clean a stylus (and how often) but there are two ways I recommend right off the bat: 1) use the tiny brush that should've came with the turntable, gently brush off the fuzz BACK to FRONT; or 2) cut a 1"x2" piece out of a Magic Eraser cleaning pad and gently (dry) brush off the fuzz BACK to FRONT. Alternately, you can just set the Magic Eraser on your bare platter (motor off) and then carefully lower the stylus down onto it. If it leaves a little "booger" on the Magic Eraser when you raise the tonearm back up, you've cleaned your stylus! Vinyl records should sound as good (or better) as CDs and streaming music on your system. I've done comparisons many times! Having been spinning vinyl since the 70's, here's what I've learned. Setting up a turntable might seem fairly easy and straightforward at first, but it can get tricky. Adjusting one thing may very well screw up something else. 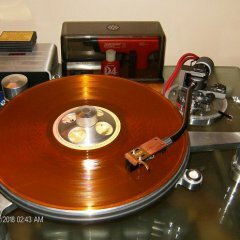 My advice is to check out you tube for videos on how to set up a turntable Mike Fremer is the guru on all things vinyl. Secondly, the sad truth about vinyl playback is the more money you spend, the better your vinyl rig will sound. It's nothing like CD playback where most players sound basically the same. I know I'll get flack over this statement, but it's been proven to be true. A few pointers: get a record calibration disc. I use HI-FI news, about forty bucks for a copy. When setting the weight for the stylus, always set it towards the heavy side of the recommended weight (I.E. stylus pressure 1.5 gram to 1.75 gram, go with 1.75.) This will not wear out your records sooner. Make sure you are plugging in your phono preamp into an input that matches the output of the preamp. Don't plug a phono preamp into a phono section on your receiver/ preamplifier, if so equipped. If you have an input labeled phono, you don't need a seperate phono preamp for a mm cartridge. This is a good starting point. If it still sounds bad after a good set-up, then it's time to trouble shoot what might need to be upgraded. I tried the magic eraser trick to clean the stylus and it definitely made a difference. I listened to several records this morning and had better results. Not perfect, but better. I used a dry microfiber on the records before I played them as well. It took care of the dust on the surface, but I’m not sure how far down into the grooves these get. I probably need to invest in a good record cleaning device and a brush for the stylus. I also watched a few videos on setting up and adjusting a deck. The tone arm on this deck is pretty basic. The adjustments can be made, just not in fine increments as far as I can tell. I will keep reading and try to get the most out of this deck, but I need to remember that I bought this to see if I liked vinyl, not as the only player I will ever own. I do like it, so I need to start researching the features and prices of what is out there. Maybe VPi will take a kidney as payment? Be careful what you wish for... some of those tables have DO MCUH adjustment, they are like a fine time piece... and you had better be prepared to makes fine adjustments until the cows come home with only marginal sonic improvement. 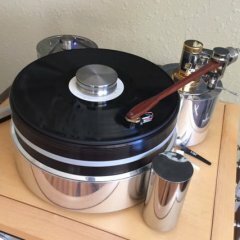 I've found that there is a happy medium between an infinitely adjustable turntable and a simpler one that is well made and solidly square/level. - you have really an entry level Ortofon cartridge. Although it should do fine when properly adjusted, do not expect miracles out of it. - Cart adjustment; I would not take that adjustment from the factory as 100% truth. My advice would be to invest some time with the turntable manual, get some basic equipment for setting up a turntable (i.e. cart alignment tool, stylus pressure gauge ) and do it yourself. Cheap magnifying glass would also help. Be very careful. Then try to listen once more. After proper alignment, I would try better phono pramplifier. My cart (Ortofon 2Mred) took a few days before it sounded any good at all. I still need to get some tools to get it set up correctly but I am liking it ok as is. It takes some playing time for a new cartridge to break in. When the cartridge is brand new, the suspension of the stylus is quite stiff, which keeps it from sounding its best. The same thing is true with speakers. It takes some playing before that initial stiffness goes away and the stylus or speaker begins to sound its best. When I first got a Shure M97xE cartridge, I kept a note of how many times it was played before it sounded as it should. It took around 25 LP sides, with improvements being noticeable after 10-15 record sides were played. When it was first played, bass guitars and drums sounded unnatural, like random shop objects being played, rather than actual musical instruments. Vocals were odd, too, but as I kept playing it, the sound got better and better. When I replaced the stylus after about 5 years, the new stylus sounded as bad as the original one had at first, then it broke in and started to sound just as fine as its predecessor had sounded in its prime. When I bought one of the last Technics SL-1210M5G turntables in 2010, I had the M97 cart transferred from the old turntable to the new one, and it's still sounding great. Accordingly, I recommend you just keep playing those records and hear what happens. Well-recorded vinyl should sound a bit better than CDs, and a quality cartridge is the key to that. Cheap record players sound bad and damage your records. I'm not referring to your setup, but to the junk equipment many of us had in our teens. Every play seemed to add some surface noise, and after 40 or 50 plays, that new record sounded as scratchy as all the old ones in the collection. This was really frustrating, so I'd play the records only once, and record them onto tape cassettes, which then became the prime music source. That was a long time ago. 25 years later, I decided to give vinyl another try and bought a used Technics SL-1400 Mk2, which came with a low-end Audio-Technica cartridge (the yellow one). That was an ear-opener! Now the records sounded quite good, like the audio magazines mentioned, but which I had never experienced. A few months later, I got the Shure cartridge, and I've been very happy with it for 14 years now. It sounds much better than the low-end Audio-Technica, and doesn't pick up every pop and click on the discs. It seems as if it tracks in a level in the record grooves that's above or below where most of the surface damage lies. It picks up all the detail in the recordings, but seems to minimize any surface noise on some of the older "high-miler" records. I highly recommend the Shure M97xE. Also, I realized that I had a collection of LPs that had been played only once! When I played them, they sounded great, and in all the years since then, they continue to sound great, without acquiring new surface noises with every play. Some are so quiet that they can be mistaken for CDs, which seems amazing to someone who spent his youth playing records on junk record players that my parents had bought. Yes, there were quite a few LPs that had not done well during the party years and had to be replaced, but luckily we have lots of used record stores in my town, plus London Drugs now has a vinyl section, and a selection of four or five turntables, including one or two from Dual. Vinyl really is making a comeback! I received a digital stylus pressure gauge last night and immediately did some measuring. The VTF set at the pro-ject factory measures 1.955g. Ortofon’s stated range for this stylus is 1.5 to 2.0g with a recommended value of 1.75g. While 1.955 it is just inside the range, would it be recommended to adjust closer to 1.75g? Even if this deck is setup correctly already, this is good exercise for the inevitable next. I envy you..... I do look forward to getting my turntable back out once we get moved into new house and my 1400+ records can be moved from my best friends house back to mine. I have all the tools, etc., to do all the adjustments with and a couple of more "vintage" direct drive (and quartz) turntables in the arsenal including a Pioneer PL-55x and a JVC QL-4F. I run a Shure V15 Type V with a Jico SAS stylus on it. I got the cartridge basically for nothing when I picked up a Marantz 6300 TT from a thrift store years ago and kept the cartridge and sold the TT (too good of money). I may one day buy an actual new table but my older 2 have both been gone through and rebuilt/upgraded where needed....especially in the power supply. That Shure V15 and Jico SAS are a wicked combination, though. Keep at it and you'll get it. There's a lot of fiddling with turntables but they are most enjoyable when set up right. I thank my grandmother in heaven quite often for saving my original records I bought when I was a kid. ...once it's burned in. Carts do need to be burned in. Also, depending on your equipment things may have to be tweaked a bit for vinyl over digital. It's a hobby. It's fun, and the work to get it right is part of the fun so stick with it. I will do some adjusting and see what happens. Clean LPs and stylus have definitely helped. I am a little excited about adjusting this table. I am very comfortable making finite asjustments to equipment similar to this. It is well inside my comfort zone. Definetely begin at a suggested weight and very slowly add if you find it's better for your liking. To do otherwise can damage the suspension in the cartridge. Right now it is set at the max recommended weight. I am planning on bringing it down to the actual recommended weight and adjust from there.